LIVERMORE — Staff and students settled into classes Wednesday at Jay and Livermore elementary schools, where grades have been configured: Prekindergarten to grade two in Livermore and grades three to five in Jay. 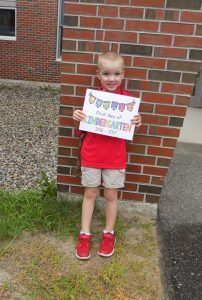 Parent Randi Cook of Jay was at Spruce Mountain Primary School in Livermore to drop off her son, Avery. The Regional School Unit 73 board voted in the spring to restructure and rename the two schools. Both had kindergarten to grade five, and Livermore had all of the pre-kindergartners. 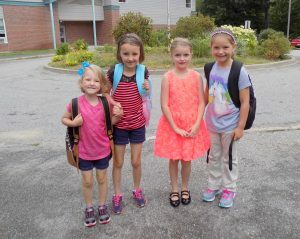 Now, students from Jay, Livermore and Livermore Falls in the same grade will be at the same school. The Jay school was renamed Spruce Mountain Elementary School. Second-grade student Zoey Gaboury said she was glad to be back in school and most excited about cheering for the first time this year. Principal Kevin Harrington welcomed students from the four early buses at Spruce Mountain Primary School. “This is the first time with two waves (of bus arrivals),” Harrington said. Afternoon dismissal is also different, he said. Jay students will be dismissed at 2:15 p.m., 15 minutes earlier than in previous years. Buses for students from Livermore and Livermore Falls will load at 2:30 p.m., Harrington said. “There are a lot of new faces, both students and teachers,” Harrington said. He expects there will be 470 students attending the primary school this year. Eaton said AMVETS, the United Way of the Tri-Valley Area and the North Livermore Baptist Church donated backpacks and supplies. “We’re very fortunate in this area,” Eaton said.